The 3 Best Cheap Electric Drum Sets for Beginners - Cut Through the Junk! The electric drum set market is significantly innovating to simulate the best possible electronic experience of playing drums. 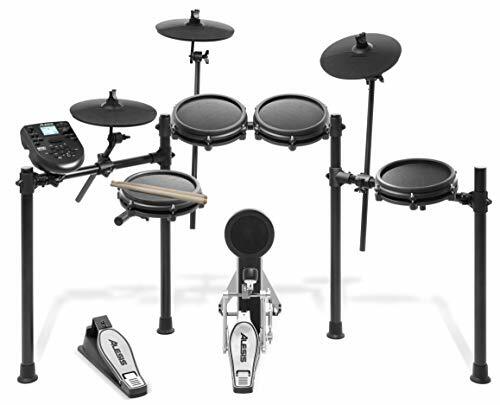 Electric drum set manufacturers are also starting to make kits more accessible in price range to a much wider range of people. However, this can come at a cost. Manufacturers can cut too many corners or features in order to get the lowest possible price. The worst of these can be in the form of bad build quality and defects. This article is specifically directed at those that want to get a good experience out of a cheap electric drum set. Cheap does not have to mean poor quality. These electric drum sets are great for beginners or for more advanced players that are looking for a quiet practice option. This kit is a slight upgrade from the very popular Alesis Nitro Kit. It includes mesh heads, with the exception of the kick drum pad. Mesh heads simulate real drum heads very nicely. These contain material stretched over a rim with an internal trigger that recognises the drum hits. Why is this kit cheap? Mesh heads on a budget electric drum set is quite a new development in the industry. These are usually reserved for much more expensive kits. The drum pads are smaller than high-end ones, but they are still quite playable. The drum module is the same as the original Alesis Nitro. It’s quite a good one for an inexpensive set, though it doesn’t have the features of a high-end one. Main benefits: Mesh heads, full kick pad, nice adjustability, very good value. Learn more about the Alesis Nitro Mesh Kit. Yamaha is one of the biggest names in the world of electric drumming. This is certainly not the best kit in the world but it is not bad for its price range. It is a very compact set that can be easily packed away. I am not a big fan of foot-switch style electric beater-less kick pedals but they are much quieter than using regular kick pedals. You can also replace this pad with a kick tower and pedal later on if you want. This kit contains all the essential elements you need. 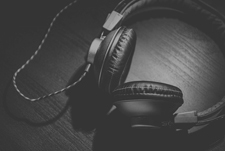 However, if you don’t have a pair of headphones and drumsticks then you will need to purchase them separately! Main benefits: Great brand, quiet kick pedal, compact, very cheap. Before people start complaining about this part, Roland have a slightly cheaper version of this (the TD-1K), but the KV version contains a very high quality mesh snare that I would class as essential to this electric drum set. Roland is not known for cheap electronic drum sets. They’re a very high quality manufacturer that charges a premium price for their products. This kit is still slightly expensive for what you get, but it’s a very good one. The mesh snare head is absolutely fantastic. The snare drum is arguably the most important element of your set for expression, therefore prioritising this one for the best drum pad is a good idea. You might think it’s a strange idea to combine both mesh and rubber heads, but this is commonly done for v-drums and they’re very playable. 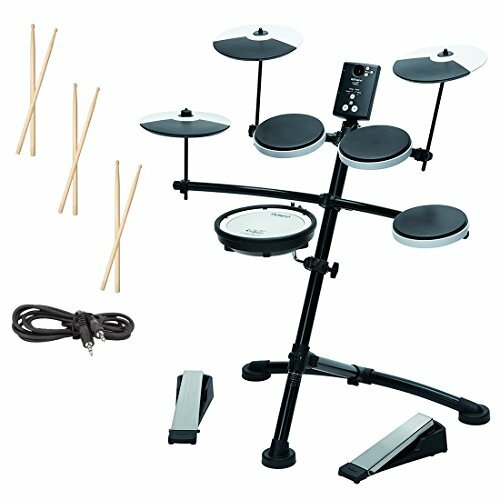 This electric drum set also includes a pedal for the hi-hat and a beater-less pedal for the kick (you can replace the pedal with a kick tower and pedal if you want). If you are looking for something very compact and quiet, then this could be a great option. If you have more space and freedom to make a little more noise then you could consider other options. Read more about the TD-1KV set. Main benefits: Great brand, quiet kick pedal, mesh snare head, compact. The only things you will need for any of the above electric drum sets are headphones and drumsticks. Check out our guides on these if you’re looking for the best ones. I would also recommend getting a decent drum throne if you are planning to play on these for a large length of time. 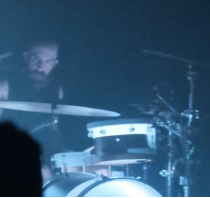 Bad posture while drumming can lead to serious back problems. Can kids play these electric sets? 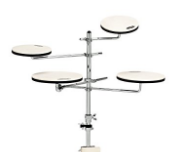 In general, kids should be able to play on these kits if they are over 7 years of age (or tall for their age!). Check out our guide on kids electronic drum sets for more information. There are alternative options for younger kids. Can I learn to play drums on these? Absolutely! If acoustic drum sets are not an option then electric kits are the next best thing. 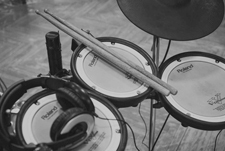 You can learn many of the important elements of drumming such as drum beats, technique, co-ordination, and rudiments while using an electric drum set. This experience can be very easily transferrable to other music instruments or full drum kits later on. 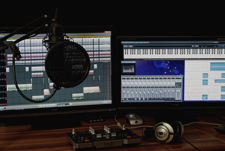 Also, electronic drums are constantly increasing in the scene of major music genres. 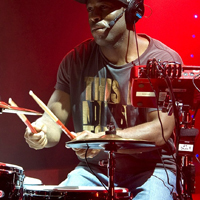 Drummers often use some form of electronic drums on stage along with their regular setup. 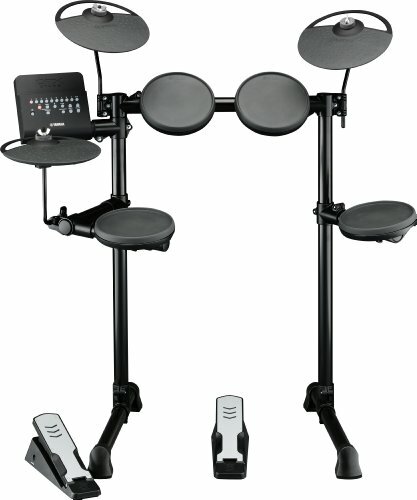 Can I play double bass on these electric drum sets? Out of the box, you’re not going to get a great double bass drumming experience. For example, you can set the DTX400 to ‘double bass drum mode’, but it won’t really replicate the experience of the beaters hitting the pads very well. The good thing is that you can replace the beaterless pedals with a large enough kick tower to accommodate double bass drum pedals. The Alesis Nitro kick tower could technically fit double bass drum pedals if the beaters are close enough together. It won’t provide the best possible experience, but it might be suitable for your needs. Check out our article on double bass electronic drum sets for more information on how to upgrade your kit. The article also includes information on electric drum sets that come with compatibility for double kick pedals right out of the box. Conclusion – What is the Best Cheap Electric Drum Set? We hope that some light has been shed on the topic of cheap electric drum sets. Remember, inexpensive does not have to mean bad quality. All of the drum sets in this article are good choices as long as you are satisfied that their features will suit your needs. If you’re on a budget, we believe that the Alesis Nitro Mesh Kit is the best choice for both features and quality. If you’re on the lookout for electric drum sets with more features, then check out our article on the best electronic drum sets to learn more.